They are problems one hopes never to find in an operating room. Problems including bone-contaminated drill bits, broken or rusty surgical instruments, holes in sterile wrappers and a needle holder that arrived with a used needle still in it. Yet these and many other events were documented hundreds of times at the Cincinnati Veterans Affairs Medical Center, according to records obtained by the Scripps News Washington Bureau and WCPO. They're known as "quality events" and "non-conforming products" in the VA system. And they were reported in 16.27 percent of surgeries at the Cincinnati VA in its 2015 fiscal year, according to an internal document . That's at least 581 problems in 3,571 surgeries, or one in every six operations during that period, numbers Scripps/WCPO verified through multiple sources and internal documents. The VA has yet to release a final report on an inquiry into problems inside the Cincinnati hospital, including concerns about sterilization. But hospital administrators have been telling employees and members of Congress that contaminated medical equipment is not an issue in Cincinnati. That led to a dramatic exchange at an April 13 Veterans Town Hall event, presented by Scripps and WCPO at a VFW post in Sharonville. "I just now understand that the investigations show there was no bone and nothing was wrong with the instruments," VA Nurse Technician Scott Landrum, who said he personally witnessed some of these incidents, told the Town Hall audience that night. "I'm the person who found the instruments and what was wrong with them. How in the world can they say that? I'm the person who filled out the report. Where did those reports go?" It's a recurring theme among Cincinnati VA whistleblowers, a group of more than three dozen current and former employees who voiced concerns to Scripps and WCPO after they felt ignored by their VA bosses. Their concerns included faulty sterilization procedures and incorrect or potentially unsterile surgical equipment. "I filed between 10 and 12 of these incident reports, and I never heard back about a single one," said Dr. Jonathon Wolf, an orthopedic surgeon who said he worked periodically during his residency at the Cincinnati VA between 2009 and 2014, including a stint as chief resident. Dr. Jonathon Wolf is an orthopedic surgeon who worked periodically at the Cincinnati VA between 2009 and 2014. Here, he talks about his experiences at the Cincinnati VA.
"From a purely customer-service standpoint, it's miserable. From a patient-safety standpoint, it's abhorrent," he said. Wolf said he filed all of those reports in a three-month period in the summer of 2013 and is convinced hospital officials never took them seriously. "They were being destroyed or at least swept under the rug," Wolf said. Now practicing in Boise, the Harvard-trained foot and ankle specialist said he never sees in Idaho the problems he witnessed in Cincinnati. "The only way they're going to improve is if they address the complaints and implement change," Wolf said. In response to Scripps/WCPO questions, the Cincinnati VA said "it is our understanding that Dr. Wolf completed patient safety incident reports in 2013 and kept these in a file which he gave to the OR Nurse Manager when he left employment at the Cincinnati VAMC in July 2014. "These were never entered into our patient safety tracking system," the hospital said. 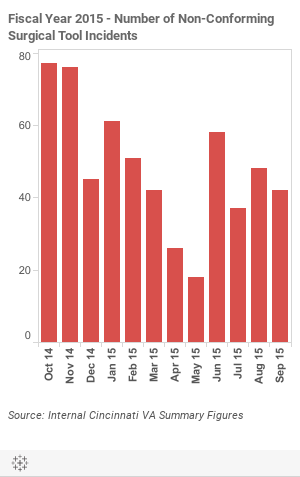 Problems with sterilization continued in 2014, 2015 and into 2016. And yet in its preliminary report on its Cincinnati investigation, the VA in Washington, D.C., announced in a Feb. 25 press release that its investigators "did not substantiate" allegations involving "quality of care for veterans." On that same day, Cincinnati VA records show at least five quality events, including a dental clinic incident in which a drilling tool showed up in a sealed package marked "Dirty." 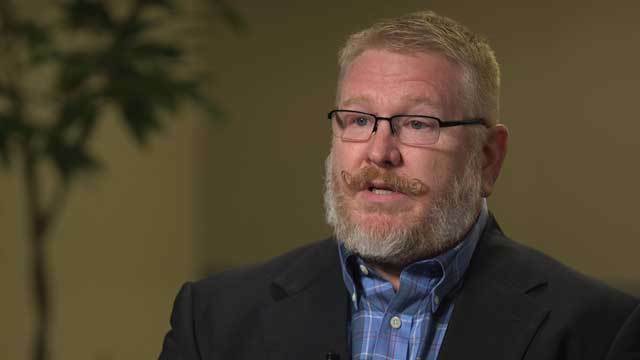 On May 20, new Cincinnati Medical Center Director Glenn Costie congratulated the hospital's Sterile Processing Service on "great reviews" by VA administrators who found "no patient safety or quality finding" in a "normal annual visit," according to an email Scripps and WCPO obtained. 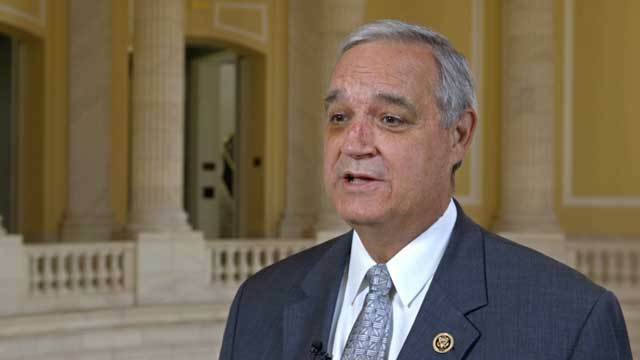 Rep. Jeff Miller is a Republican from Florida and chairman of the House Committee on Veterans' Affairs. Scripps News photo by Matt Anzur. "Well, that's typical VA," said Rep. Jeff Miller, a Republican from Florida and chairman of the House Committee on Veterans' Affairs. "They investigate themselves. They clear themselves. And they say, 'Nothing to see here. We're gonna move along.'" The Cincinnati VA did not respond to multiple interview requests, but answered questions in writing, defending its record on patient safety. "We have had 12 external reviews so far this year and we are proud of the fact that all have acknowledged the high level of quality here," the hospital said. The Cincinnati VA would not release internal records on quality problems, but whistleblowers did. Internal reports obtained by Scripps and WCPO show a three-year pattern of operating-room mishaps. A "retained foreign body" in the eye of a 79-year-old Korean War veteran in July 2013. A 2013 report to a VA review panel said a "strand" was found in the veteran's eye following cataract surgery. A report on the incident said doctors removed a "long white fibrous strand" from the veteran's eye. After "conversations with multiple staff members," it was determined that the fiber likely came from a surgical tool with a silicone tip, "which becomes increasingly sticky with each reprocessing and thus more likely to attract fibers that can only be seen under the microscope." 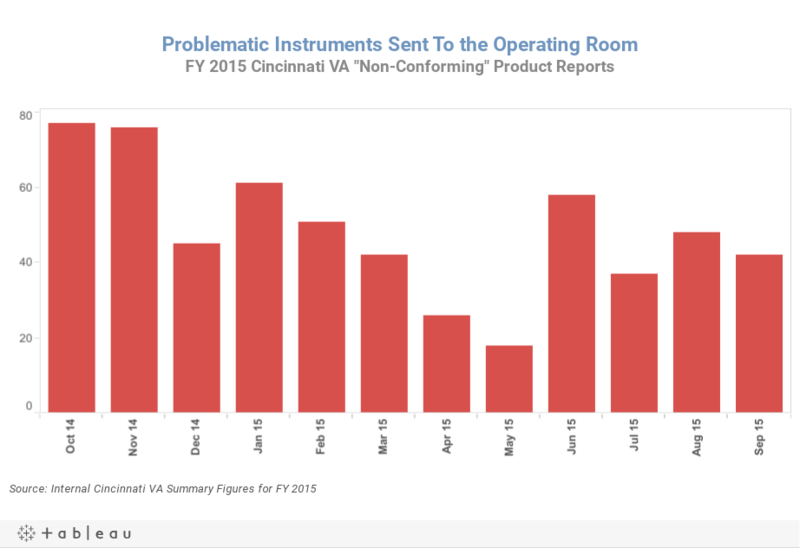 The report indicates the Cincinnati VA was ordered to halt the practice of reusing those tools after the July incident. Individual descriptions of quality problems documented at least 11 cases of "bioburden" in the 12 months that ended Jan. 4, 2016, including two events on the same day in November. A VA policy memorandum defines bioburden as "organic material" -- such as blood, bone and other bodily debris -- that "must be eliminated before effective sterilization can take place." The two problems on Nov. 9 included a dental kit that resulted in a five-minute delay: "Scaler has debris left on it!" A second problem on Nov. 9 involved equipment prepared for shoulder-replacement surgery: "Suspected bone inside cannulated glenoid drill bit." 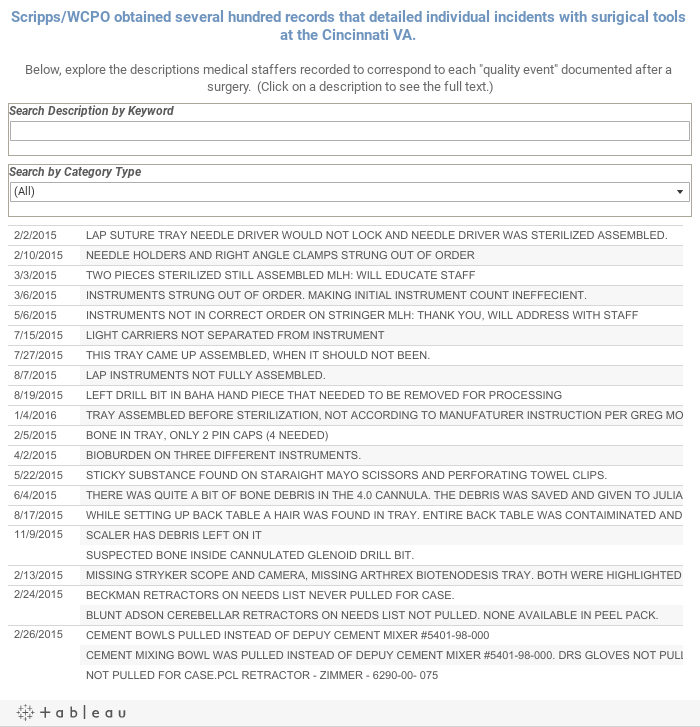 Throughout the second half of 2015, VA staffers documented problems with the underreporting of incidents and the computer system used to report them, "making reporting inaccurate," according to meeting minutes for the Operative and Invasive Procedures Committee at the Cincinnati VA. "The committee believes staff is not reporting all issues." 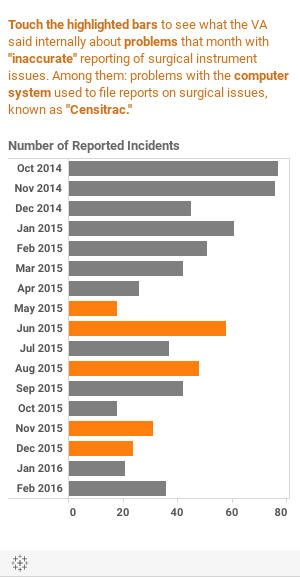 The same committee documented an increase in problems in the first two months of 2016. The committee tracks the problems as a percentage of all surgical cases. It increased from 6.77 percent in January to 11.21 percent in February. The Cincinnati VA said it uses a computer system called Censitrac to ensure "issues are caught before surgical instruments ever reach the veteran. We exceed the community standard which reports only major issues." Congressman Brad Wenstrup, a Republican from Cincinnati, has twice raised concerns about dirty surgical tools at the Cincinnati VA. In September 2013, he inquired about delayed and canceled surgeries after a constituent contacted him. Internal records show hospital officials reviewed 58 cases between July 1 and Sept. 4 in response to Wenstrup's inquiry. They confirmed two surgeries that were canceled "because equipment and supplies were not ready" and five cases that were delayed because of "issues surrounding the reprocessing" of surgical instruments. The VA assured him the problem would be handled, Wenstrup spokeswoman Meghan Waters said. "When additional concerns about the Cincinnati VAMC were brought to our attention in early 2015, we relayed them to the House Veterans Affairs Committee's Subcommittee on Oversight and Investigation," Waters added. The investigation is still ongoing, she said. Mike Brooks, a certified registered nurse anesthetist, said the hospital's former acting chief of staff, Dr. Barbara Temeck, told operating-room staff soon after her arrival in July 2013 to stop complaining about the incidents – furthermore, he said she also required the staff to halt surgery while patients were on the operating table so she could inspect the incidents herself. Mike Brooks is a certified registered nurse anesthetist. Scripps News photo by Matt Anzur. "It could be, if she was in another meeting, it could be 20 minutes, half an hour, with the patient under anesthesia," Brooks said. Ken Hawley, Dr. Temeck's attorney, denied this allegation. Dr. Temeck was reassigned to a paperwork job after VA investigators substantiated a Scripps and WCPO report that she prescribed pain medications to the wife of her former boss. Dr. Temeck has since filed her own whistleblower claim, saying she was unfairly targeted by surgical staffers who wasted millions of dollars at the Cincinnati VA by collecting "full-time salaries and benefits" for "less than full-time work." In a phone interview, Hawley said that upon Dr. Temeck's arrival at the hospital in July 2013, she discovered "a whole slew of unsanitary, unhygienic conditions" in the operating room. "Dr. Temeck got those cleaned up," Hawley said, noting that the hospital soon passed two subsequent inspections, including one that The Joint Commission on hospital accreditation conducted "early the next year" in 2014. 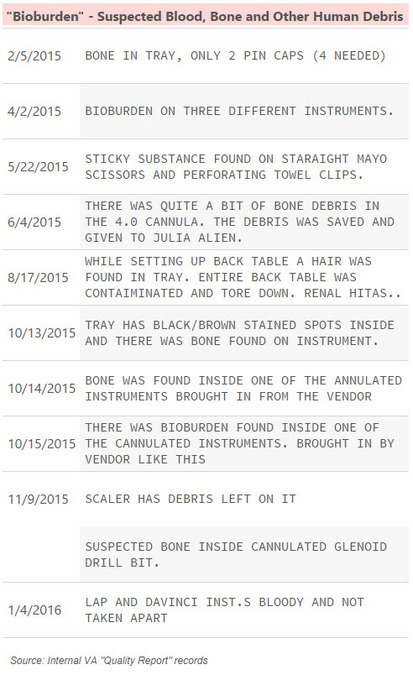 List of suspected "Bioburden" incidients. Hawley also said that bioburden discovered on surgical instruments was determined to be calcium deposits that came from equipment, not bone from previous patients. "They repaired or replaced that equipment. That happened about three years ago and hasn't happened since," he said. 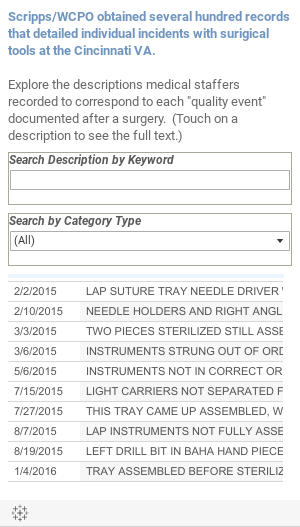 Hawley denied Dr. Temeck, the acting chief of staff, knew about the hundreds of wide-ranging problems with surgical instruments that staff reported throughout fiscal year 2015. "I'm sure she did not. Because if she had known about them, she would have done something about them," he said. "A chief of staff is an administrator. She's not the one who is actually doing these things." When asked about the chain of command, the VA said the chief of staff chairs a board that oversees two internal quality control committees. The VA's policy from last July states that the medical center director is responsible for enforcing sterile-processing rules and the hospital's chief nurse executive is in charge of monitoring performance of its sterile-processing department. Mike Brooks argues some managers who remain at the Cincinnati VA are more interested in burying the problems than crafting solutions to prevent them. "Still today, there are some leaders there that absolutely deny all the complaints that we have made," Brooks said at the Scripps/WCPO Town Hall event in April. Brooks was the first to speak publicly about dirty surgical tools. In February, he described bone and other debris on surgical instruments that were sealed in packs after being processed for sterilization. Brooks said none of the federal investigators who were assigned to look into problems with sterile processing at the Cincinnati VA ever interviewed him. "There's a certain culture at the Cincinnati VA right now," Brooks told a crowd of about 100 veterans and VA employees at the Town Hall. "If you point something out, you become the problem." The Cincinnati VA said the number of surgical items that met its standards "showed an improvement over the last several years." 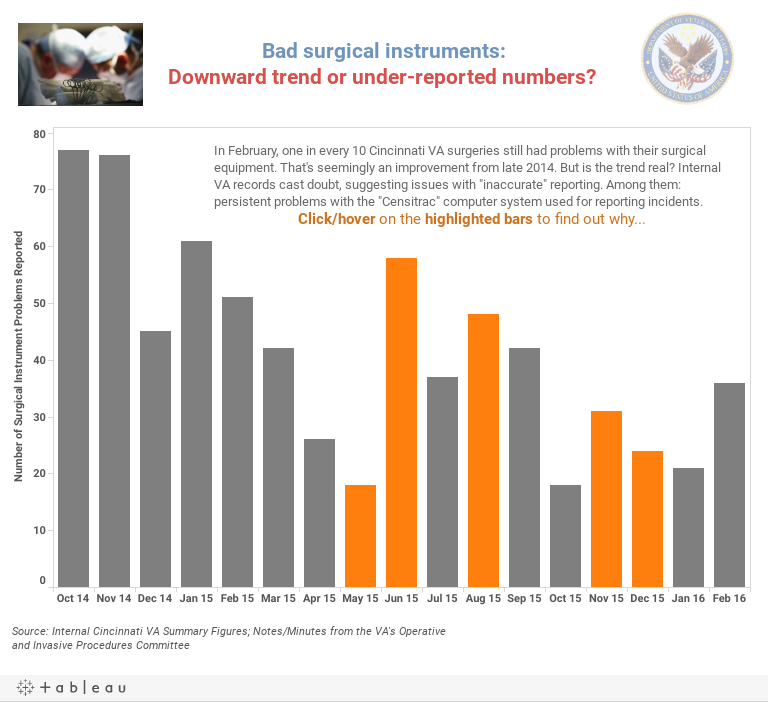 When asked in April about problems with dirty or missing surgical instruments, Robert McDivitt, the VA's top-ranking official in Ohio, Indiana and Lower Michigan said the VA is taking all whistleblower allegations seriously. "There have been at least three reviews looking at sterile processing," McDivitt told the Town Hall audience. "They have preliminary conclusions, some of which were published. But the final reports have not come out." Sitting in the audience, VA Nurse Technician Scott Landrum was visibly agitated by McDivitt's answer and said he had filed report after report, detailing sterilization problems at the VA.
"I'm the person who found the bones on the instruments and it happened dozens of times and I've had to break down an entire room before with a patient on the table," Landrum said. "How in the world can someone say that it didn't happen? I did it!" McDivitt told Landrum that he would be happy to learn the details and described the VA as an "open and transparent agency." But two days after that exchange, Landrum said he was summoned to the front office of the local VA and told he would be fired. Nurse Technician Scott Landrum talks about the Cincinnati VA.
Landrum hired an attorney to challenge his firing. VA officials in Washington told Scripps/WCPO in early May that his case was under review. "Whistleblower retaliation is unacceptable and intolerable at the VA," said James Hutton, director of media relations for the national VA. "We are working hard to create and sustain a climate that embraces constructive dissent." On June 3, a hospital spokeswoman said Landrum resigned, but declined to comment further. Landrum told Scripps/WCPO he "got a better job." Landrum was "one of 53 employees who made entries into Censitrac. Mr. Landrum entered 109 of the total of 3,145 entries in Censitrac ... All of these issues were reviewed as part of our risk management improvement process," the VA said in a written response. Landrum believes the VA was retaliating against him for speaking up, adding, "there was no climate of wanting to fix a problem. "It really took a lot out of me," he said. "I felt betrayed by the VA. Because the truth is, I just really wanted things to be better. And rather than things getting better, they just want things to stay status quo." Angela M. Hill and Brian Niesz contributed to this report. Scripps News Washington Bureau and WCPO will continue to report on conditions and factors in the Cincinnati VA and nationwide. If you have a tip for us to investigate or if you're a veteran who wants to share your experience seeking care at any VA hospital in the nation, drop us a line.